A harsh environment for stocks was one of two factors pressuring shares of the remittance and ATM transactions giant. Stock in global-transaction specialist Euronet Worldwide (NASDAQ:EEFT) fell 12.9% in the month of October, according to data from S&P Global Market Intelligence. Check out the latest Euronet Worldwide earnings call transcript. 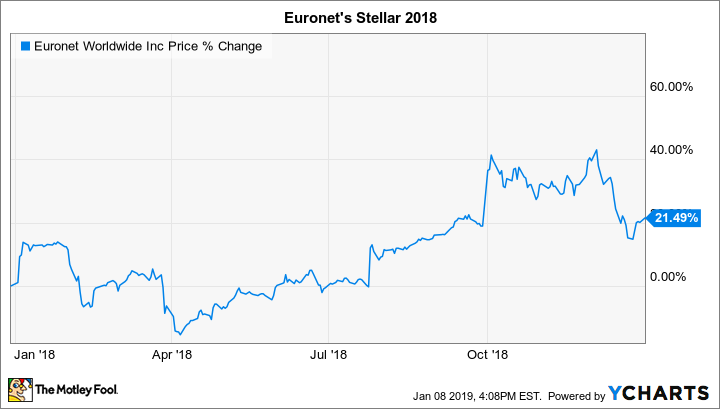 Euronet shares succumbed to the malaise of the broader market last month, a period in which the S&P 500 index and the Nasdaq Composite index each lost roughly 9%. Euronet's beta of 0.80 indicates that it's typically less volatile than the S&P 500, which, as a benchmark for the broader market, carries a beta of 1. So it's perhaps surprising that the EEFT symbol sold off more than the aggregate equities market last month. The sharp drop notwithstanding, Euronet relayed positive news to shareholders near year-end, announcing on Dec. 17 that it's signed an agreement with Banco de Moçambique, the central bank of Mozambique, to provide the country with "a modernized national payment network solution." The agreement calls for Euronet to supply state-of-the-art software to enhance Mozambique's financial system. The company's services will encompass transactions processing, ATM and point-of-sale device adoption, and a broad array of mobile-payment solutions including bill payments and the introduction of digital wallets for consumer use. The deal represents an important win for Euronet Worldwide (financial terms have not yet been disclosed). While most of its revenue and earnings are driven by ATM usage in Europe and Asia alongside a global remittances business, Euronet has an opportunity to utilize its technical prowess to deliver higher-margin consulting and service implementations to corporations and governments. The agreement with Mozambique's central bank also will likely result in some ongoing recurring revenue for Euronet as it gradually installs ATMs and provides financial services to consumers through its mobile and digital-services segment known as "ePay." Euronet's transaction volumes improved throughout 2018 and resulted in double-digit year-over-year revenue expansion in the third quarter of last year. Shareholders curious about earnings momentum heading into 2019 won't have long to wait: The company will issue its report on the final three months of 2018 in the first week of February.